8 Limbs is partnering with City Arts Magazine to profile local artists who practice yoga at 8 Limbs. For the August issue, we profile Rebecca Young, a professional musician and bass player who has recorded, toured, and performed with a myriad of singer/songwriters and bands in many genres, most recently with Seattle artists Lindsay Fuller, Darren Loucas, Jeff Fielder, Cobirds Unite, the Jelly Rollers, Downpilot and Johnny Bregar (kids and family music). Rebecca was born and raised in Toronto, Canada. She is a Teaching Artist at West Woodland Elementary school where she loves to explore the playful, creative potential of musical expression that all K-5 children can enjoy and share. Rebecca received her Yoga For Kids teacher training at Next Generation Yoga in New York in 2003 and will begin teaching Kids Yoga Classes at 8 Limbs Phinney Ridge, her neighborhood studio, in the fall. She is also a newly certified instructor of the social emotional literacy program, Roots of Empathy, which she teaches in Seattle Public Schools. Rebecca loves to combine her love of music in working with children and yoga and welcomes the opportunity to provide the enthusiasm, adaptability and ability to work with groups of children of all sizes, ages and abilities. You can find Rebecca on stage with Sera Cahoone at Bumbershoot on Saturday, September 1 – or at 8 Limbs Phinney Ridge this fall. I arrived at yoga having left a fun but chaotic life in New York City to start a family and create a more balanced life in Seattle. It took forever for me to understand why I had found yoga and it me, but I stuck with it for some reason. I have been practicing yoga for about 15 years. I have only really understood that I can’t live without yoga for about the past 5! Yoga supports my art because yoga supports my whole universe. It is my anchor, my roots. When I practice yoga I am a better mother, a better teacher, a better musician and I am more compassionate with myself and my family! Yoga saves me, day after day, allowing me to live in a complicated world and juggle 1,000 things at once with a little grace. I had practiced occasionally at various 8 Limbs locations around Seattle. 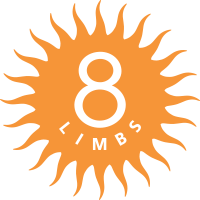 When 8 Limbs opened on Phinney Ridge, I took advantage of unlimited summer classes at a special rate. I started practicing daily, which I had never done before. I couldn’t stop. I can walk to the studio from my home, and I move heaven and earth to try to get to one class, morning, afternoon or evening every day. It’s hard to pinpoint the most important thing I’ve learned through my practice. If I had to sum up, I’ve learned that I’m happiest when I am living simply. And as long as I have my yoga mat and can clear even a few minutes in my day to sit, breathe and move on my mat, the day will be a lot sunnier, even here in Seattle!